I was out of work early and with little persuasion I took a walk around No.6 and No.4 tanks. It came as a complete surprise when I arrived to look across No.6 to find with exception of 25 Mallard no Eurasian Teal. A herd of Canada Goose were grazing on No.3 with a flock of c70 Wigeon, a mass of Lapwing and Golden Plover hunkering down in the short turf. The first lamb of the year was spotted on the tank with a further 3 on the Manchester Ship Canal path. A flock of just 9 Shoveler on the ‘Splashing Pool’ and a Little Egret flew overhead. I contined along the canal and several more Mallard and a raft of 34 Tufted Duck with a single Great Crested Grebe in their company. 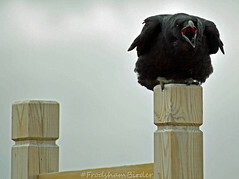 The Raven were in good numbers over the Frodsham Score with one pair tormenting a Common Buzzard,for the hell of it. The herd of 24 Mute Swan were alongside the Holpool Gutter while a carpet of Lapwing and Golden Plover could be seen in a field near to the Ince Berth and every one of them took to the air when they spooked by an unseen threat. Walking back to No.6 tank and far in the distance a flock of 2000 Starling were heading in the direction of the Holpool Gutter.